Tampa Bay, which led the NHL in goals last season, had scored just twice over 125 minutes in its first two games. 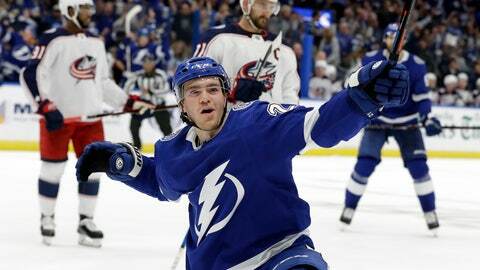 The Lightning were held scoreless during the final 159:27 of the 2018 Eastern Conference Final by eventual Stanley Cup champion Washington. Columbus got goals from Josh Anderson and Oliver Bjorkstrand, and Sergei Bobrovsky stopped 23 shots. Columbus coach John Tortorella has been rotating his goaltending between Bobrovsky and Joonas Korpisalo. As the deficit mounded, Tortorella “had no thought about taking” Bobrovsky out. Hedman and Paquette scored before Gourde put the Lightning up 3-0 late in the first and stopped an 0 for 10 season-opening Tampa Bay power-play slide. Anderson, who beat Tampa Bay’s Dan Girardi to wipeout a potential icing and soon after scored, and Bjorkstrand cut the Blue Jackets deficit to one in the second. Point’s goal with 44.6 seconds left in the second made it 4-2. Point and Alex Killorn both had a power-play goal during a four-goal third-period that also saw Kucherov get his first goal. Miller got Tampa Bay’s fourth power-play goal with two-tenths of second left. NOTES: Julian Green was among a group of U.S. Men’s National Soccer team players in attendance. They were watching both teams play soccer during a pregame workout when the Blue Jackets had their ball get stuck on an overhanging vent. After players attempted to dislodge it with a pole, a stadium worker retrieved the ball using a portable lift. … Columbus D Seth Jones, who sprained his knee during the preseason, could be back in two to four weeks. … Tampa Bay star Steven Stamkos got his first assist this season but has no goals over 15 games, dating to last season. Blue Jackets: Host Philadelphia Thursday night. Lightning: Play the fourth of a five-game homestand Tuesday night against Carolina.